This book proposal was written on 17 September 2008. Reference image for book proposal Tracey Emin bites back (2008) by R.J. Preece, who was informed c. 2001 that the artist hated this exhibition review: Tracey Emin at Lehmann-Maupin (1999). Tracey Emin has been one of the most media-covered artists of our time. While this quantity of information has created a wealth of insights into her art and life, it also has produced a number of article accounts that are factually inaccurate or misleading. 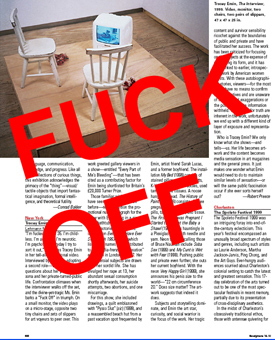 With some of these texts, Tracey Emin disputes the content, sometimes quite heatedly and understandably. This book, which features a selection of 30-50 disputed articles, provides the artist with an opportunity to "set the record straight". The format of this book appears like a pre-published book copy awaiting changes by a reviewer, for certain reasons. It first enables Tracey to write her comments both on and near the specific points she disputes— and to present that. The format also enables Tracey to provide additional information about what she thinks about the statement, article and writer, thereby giving more of a context for readers to make up their own minds. With this approach, Tracey Emin demonstrates a way for artists and media figures to directly "set the record straight", from their perspective, on a point-by-point basis, into one resource document. Without action, problematic information— sometimes chunks of fiction— run the risk of entering other articles, book publication and histories in the future. This can occur as problematic writings increasingly become primary source material through the distance of time. Also, readers and writers are also not always knowledgeable that an artist disputes information presented in a range of published material. At times fun and amusing, at other times worrying and disturbing, Tracey Emin bites back shows the reality of the problematic discourse on Tracey Emin as it was prior to the publication of this book. Plus it is hoped that artists may appreciate another aim of the book: it’s a case study that flips the intense and sometimes unfair gaze on the artist. Artists are sometimes thoroughly grilled about the quality of their work and the authenticity of information they provide. Now it’s time for certain writings and writers to be placed under the spotlight. And who better to peel back the layers, but Tracey Emin. RP trots out the critical (media) discourse analysis line. In short, the approach I take is partly based on an influential UK academic, Norman Fairclough, but modified to an art and design context. The emphasis is on what can happen behind the scenes that result in texts that are inaccurate, misleading information, etc. This could incorporate instances related to Tracey’s experience. This may be the first book with a critical media analysis approach in an art sphere, although this approach is far more developed in critical examinations of government and business communications. The visual format however would be, I think, unique. I propose a Q&A that would be done after Tracey reviews and comments on the press clippings. The purpose would be to bring Tracey directly into previewing the selected articles that are examined, disputed, etc. By doing this after Tracey makes the text comments, the examples will be fresher in her mind. RP proposes a written-over reprint, crossed out, scribbled with notes text presentation somewhat comparable to Tracey’s review copy of the Thames and Hudson book. Why? Because it’s rough, it’s real, it’s interactive, and it aims to take away the authority of the perfect-looking presented text which we all know is at times highly misleading, as with the selected reprints. It exposes a discussion / reaction that is not usually for public view. For example, Newsnight mentions which people, companies, and government agencies refuse to comment to expose this kind of media-shaping position. I propose that this list be given to readers, followed by comments by Tracey expressing concern about the text, and the stated reason for the writer / publication’s refusal. This then helps to get the information, or doubt, out there, but also works practically within the publishing system. The concept does intend to be respectful to all, but also peel back the layer of media dynamics to show the truth of the process. Perhaps quotes are added afterwards that explain why Tracey approves of these texts. With this addition, Tracey’s intention then is hopefully nailed down for the public.